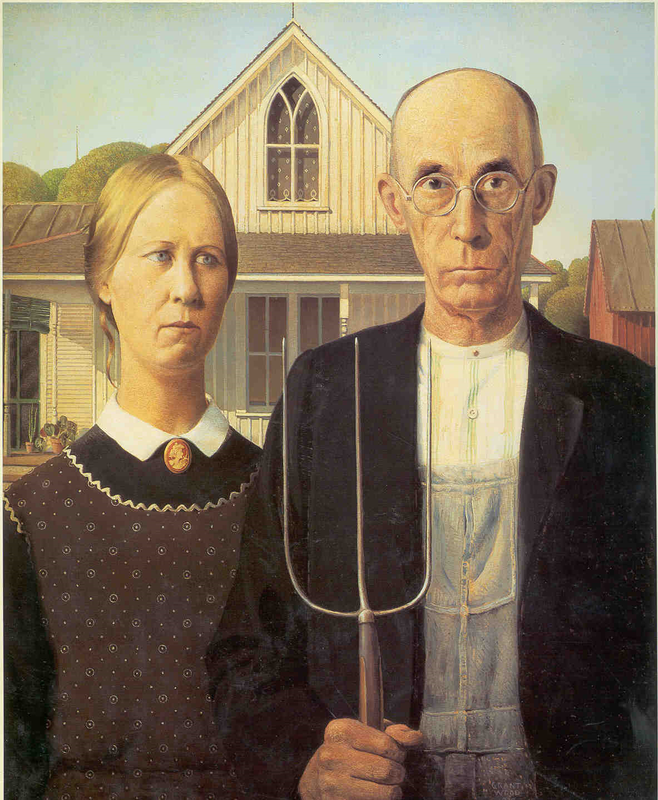 ‘American Gothic’ by Grant Wood is one of the most popular and recognizable paintings in the history of American art. In fact, there have been countless parodies of this particular art piece made around the world. One may be surprised that such a simple painting can make such an impact. After all, the painting only features a man and a woman standing side by side in front of a wooden house. However, Wood’s well-known masterpiece conveys much more than what is seen by the viewer. The focal point of the painting are the two subjects, the aforementioned male and female. The man, a 19th century farmer, was modeled by the painter’s dentist BH McKeeby from Cedar Rapids. The woman, who is supposed to be the farmer’s spinster daughter, was modeled by Wood’s sister Nan. The 19th century wooden house found in the background actually exists in real life. The structure, which was built in the American Gothic style, is a tourist attraction in the southern town of Eldon, Iowa. The title of the painting refers to the architectural style of the said house. Grant Wood is from Iowa. He saw the house in Eldon, and became inspired by it. The realm of small towns has always been special for Wood, which is why most of his paintings reflected small town living. ‘American Gothic’ was created in 1930, a time when the United States was facing the Great Depression. It is said that the art work is a representation of the strict yet persevering nature of Middle America. Wood is a known figure in Regionalism, an art movement that focused on the life of rural America as opposed to the scenes of big cities and cosmopolitan living. As expected, this movement originated from the Midwest. While Regionalism is seen as an attack on European art, the influence of Europe on Wood cannot be denied. As seen in ‘American Gothic’, the style and austere arrangement of the subjects is a nod to Northern Renaissance art. ‘The Scream’ (also known as ‘The Cry’) is the creation of Edvard Munch, a printmaker and impressionist painter from Oslo, Norway. He gained fame and worldwide recognition because of this specific art piece. Munch is best known for art with strong and suggestive emotional and psychological themes. Most of his works deal with sickness, death and misery. This is the reason he became an influential figure in the development of German Expressionism. Munch created ‘The Scream’ in 1893. The painting was included in his collection entitled ‘The Frieze of Life,’ wherein all art pieces were inspired by his personal experiences. In ‘The Scream,’ there is a figure that stands on bridge; his hands are on his ears as his mouth is open, as if to let out a piercing cry. In the background of the figure is the setting sun, as depicted by the bright red and orange curves. The painting is quite disturbing, and has been described as the ultimate image of anguish. 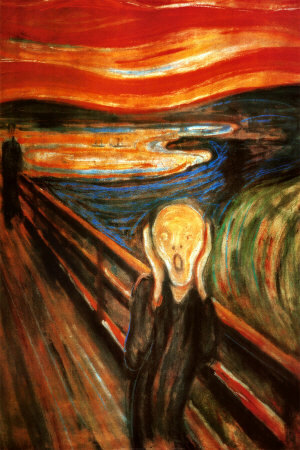 He created several versions of ‘The Scream’ between 1892 and 1896. The best indicator of a particular painting’s popularity is mass production. A truly popular painting becomes ubiquitous, as its image will be used in various media and merchandise. The image will be seen as reproduced in posters and printed on everything from cups to refrigerator magnets. Another sign of fame is parody. Famous paintings get parodied often. If these two factors are to be considered, then ‘The Scream’ by Edvard Munch is truly a famous masterpiece. Rembrandt van Rijn is one of the world’s most famous artists and the most notable Dutch painter. He has made many art works during his time, but probably the most well-known among his collection is ‘The Anatomy Lesson of Dr. Nicolaes Tulp,’ This remarkable masterpiece, which was created in 1632, is actually a portrait. This painting is so exceptional that even Vincent Van Gogh was impressed. Rembrandt was only 26 years old when he made his famous painting. A few years prior to the creation of the masterpiece, he was first a student of master Pieter Lastman in Amsterdam. After studying under Lastman, Rembrandt returned to Leiden, where his talent was noticed by an art-loving statesman and an art dealer. It was the latter who was responsible for commissioning the Dutch artist to make a group portrait with Dr. Nicolaes Tulp. During that time, group portraits were very popular. It became the status symbol of an emerging middle class. As the middle class became successful financially, they sought to see themselves and their new wealthy lifestyles depicted on paintings. Most of them did it to show others that they were in the company of the powerful and privileged. Rich families, famous people and statesmen all commissioned group portraits. One of the most famous people in Amsterdam during that time was Nicolaes Tulp, an anatomist and surgeon. The painting shows him giving an anatomy lesson to seven individuals: five rich middle-class men and two physicians. What makes this painting so extraordinary is the trademark of its artist: movement and attention to human detail. While other group portraits during that time were formal and rigid, Rembrandt’s was casual and showed motion. Meanwhile, what made Van Gogh stunned was the flesh tones in the painting. The contrast between the white sheet that covered the body and the pale face of the dead man is astonishing. 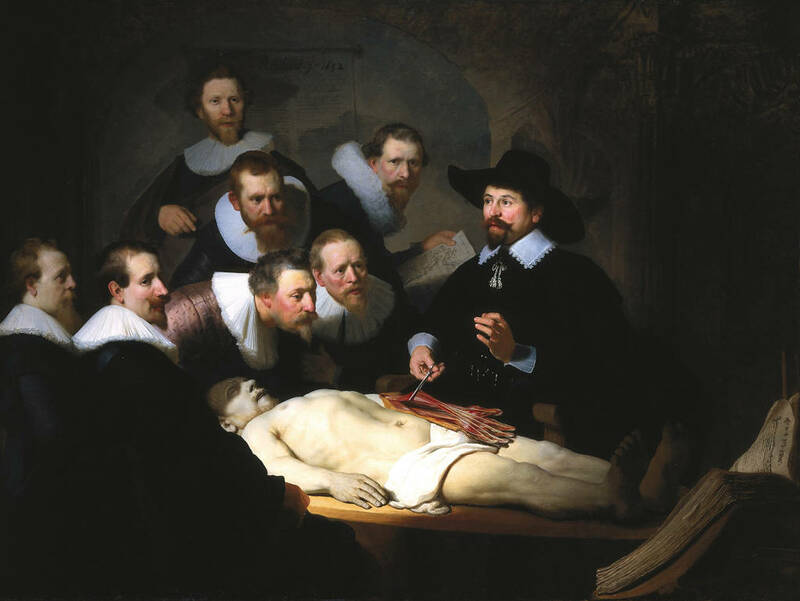 The Anatomy Lesson of Dr. Nicolaes Tulp may seem like just a group portrait, but Rembrandt’s talent and skill in painting makes it so much more. Johannes Vermeer may not be a household name like other artists such as Leonardo da Vinci, Vincent Van Gogh or Pablo Picasso, but his masterpiece speaks for itself. His artwork, ‘Girl with a Pearl Earring’ is one of the most famous paintings in the world. In fact, Vermeer’s piece is so famous that it inspired a novel (penned by Tracy Chevalier) and a movie (which starred Colin Firth and Scarlett Johansson). There is a reason Vermeer is not as well known as other painters: there are only 36 paintings attributed to the Dutch artist, some of which are unaccounted for. Because his art pieces are rare, his name was forgotten after his death, even though he was a notable figure in Delft when he was still alive. Thankfully, the fame of ‘Girl with a Pearl Earring’ kept Vermeer alive in public consciousness. The appeal of the Vermeer’s ‘Girl with a Pearl Earring’ is similar to da Vinci’s ‘Mona Lisa’: it thrives on mystery. The subject of Vermeer’s painting is an unknown girl, and it has caused the art community to speculate about the girl’s identity. People wanted to know about the subject, and they wonder if the piece is meant to be a portrait or not. In her novel, Chevalier speculated that the subject was a maid of Vermeer, one of the servants living with him. The subject was given the name Griet, a 16-year-old Dutch girl who catches the eye of the painter. As the speculations continue, one thing is for sure: just like the Mona Lisa, the subject’s eyes and smile are enigmatic. 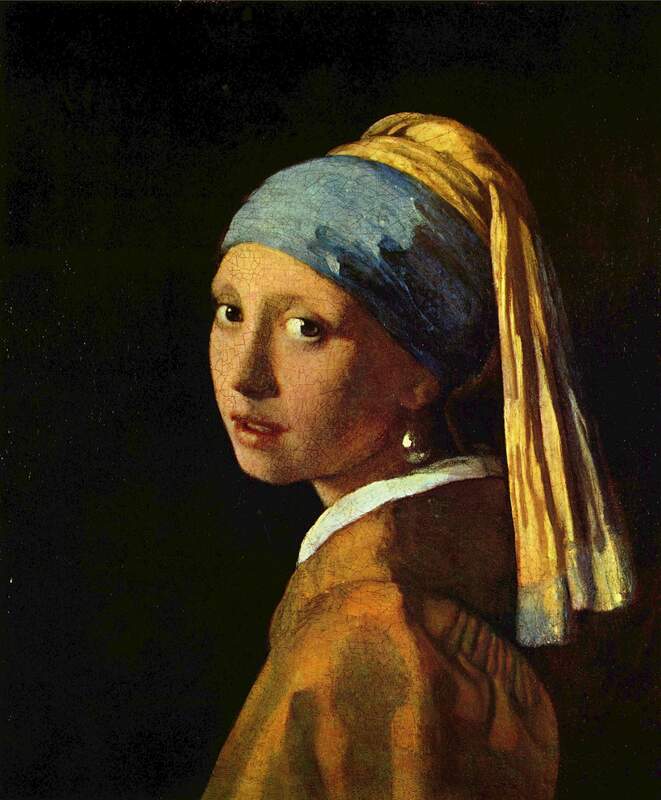 ‘Girl with a Pearl Earring’ is a fine example of Vermeer’s skill as a painter. Like his other paintings, this one shows solitary females still and radiant in domestic environments. The best thing about them is that they are paintings but they seem like photographs, with their bright areas, sharp contrasts and striking perspectives. It is a great thing then that Vermeer left exceptional paintings behind, works to be appreciated for many years to come and will remind people of his extraordinary gift. 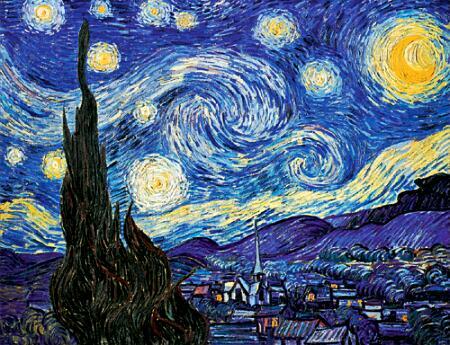 Almost anyone who sees the ‘Starry Night’ painting knows it is a Van Gogh creation. ‘Starry Night’ is not only the most popular painting ever made by Van Gogh, but it is also one of the world’s most notable masterpieces. It is this painting that gave the artist worldwide recognition, though he never lived to enjoy it. Van Gogh succeeded in selling just one painting when he was alive (‘The Red Vineyard’), but after his death his fame grew and he became considered as one of the world’s best painters. He is deemed as the greatest Dutch painter after Rembrandt van Rijn. ‘Starry Night’ is known all over the world not only because of its popularity but also because of its influence. This particular painting of Van Gogh has inspired poetry, fiction, songs (the most famous of which is Don McLean’s ‘Starry, Starry Night’) and CD-ROMs. The image has also been used in countless posters and products, making Van Gogh’s painting almost ubiquitous. Completed in June 1889, ‘Starry Night’ was created by Van Gogh in the mental asylum in Saint Remy de Provence, Bouches-du-Rh, France. The painting was finished a little over a year before Van Gogh killed himself at the age of 37. The Dutch artist suffered from depression, and it was his mental instability that caused his demise. When he admitted himself in the psychiatric center at Monastery Saint-Paul de Mausole, he often painted in the garden, which became his favorite subject. Unfortunately, Van Gogh was not able to paint his famous painting outdoors as he wanted. Because of the erratic behavior caused by his mental condition, he was forced to stay indoors. Van Gogh had painted ‘Starry Night’ from just his memory, which is probably why the painting is the most emotionally powerful among all of his works during this period. People would be surprised to know that “Starry Night’ is not the only painting of the night sky that Van Gogh ever created. ‘Starry Night Over The Rhone’ was first. However, it was his second depiction of the starry night that cemented his status as one of art’s best figures.